100% Contaminant FREE! TheraLife® Omega-3 is purified through “molecularly distillation” where the lighter fractions of the Fish Oil is collected leaving behind heavier fragments of mercury, PCB and other contaminants. We provide the highest levels of Quality, Purity, and Potency! Fish oil is known for being rich in unsaturated fatty acids. These fatty acids are known to benefit the eye and may assist in the prevention of macular degeneration, cataract and dry eye. Fish oils, also called omega-3 fatty acids, contain components called docosahexaenoic acid (DHA) and eicosapentaenoic acid (EPA). These acids are naturally found in the retina of the eye and are vital nutrients that maintain healthy function of the retina. As we get older, our bodies may produce less DHA & EPA and the only the way the body can take in these vital essential fatty acids is through proper nutrition and supplementation. Why TheraLife® Omega-3 Molecularly Distilled Fish Oil? Omega-3 Fish Oils that can be found in health food stores are often of a lower quality and contain more contaminants and toxins than refined oil. TheraLife® uses only the purest fish oils that have been molecularly distilled and 3rd party tested This ensures toxins and contaminants such as mercury, lead and PCB’s meet or exceed acceptable limits set by the Council for Responsible Nutrition (CRN) and other regulatory agencies. Why do we recommend the use of Omega-3 Fish Oils with TheraLife® Eye Enhanced? 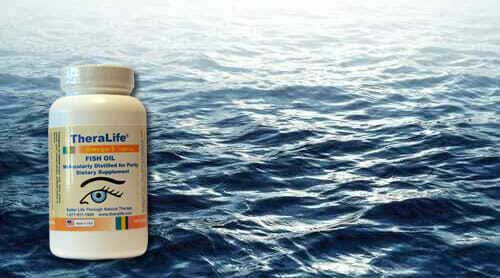 TheraLife® Dry Eye Enhanced is designed to restore and increase your body’s ability to generate its own natural tears. However, those with moderate to severe dry eye symptoms may need extra measures to temporarily help minimize the discomfort caused by dry eyes. The fatty acids found in Omega-3 Fish Oils help to thicken your natural tears and prevent excessive tear evaporation. However, a thickened tear isn’t enough. TheraLife® Dry Eye Enhanced works intra-cellularly to restore normal function of tear secretion glands to secrete tears and improve the natural quality of your tears. Thus, TheraLife® Eye Enhanced in conjunction with TheraLife Omega-3 Fish Oils is an excellent way to target and treat dry eyes. All TheraLife® ingredients are tested to ensure safety, purity and the highest biological activity. TheraLife® capsules are manufactured following GMP quality guidelines in pharmaceutical grade facilities in the United States. TheraLife® Inc. offers a 90-day money back guarantee on all products. Reduce chronic inflammation from dry eye conditions. Produces a better quality tear that prevents excessive tear evaporation. Reduce risk of Macular Degeneration, Cataract and other various age related eye disorders. Omega-3’s benefit other regions of the body including the brain, immune system, cardiovascular system and the skin. Since the year 2000, TheraLife® Dry Eye Enhanced has successfully treated the dry eye conditions of thousands of satisfied customers. For moderate to severe dry eye conditions, TheraLife® recommends the use Omega-3 Fish Oils in conjunction with TheraLife® Eye Enhanced to treat their dry eye symptoms. Because of our growing concern of the quality of fish oil products in the market place, we have decided to sell our own brand of Omega-3 Fish Oils. Why Omega 3 and Not Omega 6 for Dry Eye Relief? Our modern diets are rich in Omega 6 and insufficient in Omega 3. Omega 3 Fish oil is known for being rich in unsaturated fatty acids. These fatty acids are known to benefit the eye and may assist in the prevention of macular degeneration, cataract and dry eye. Fish oils, also called omega-3 fatty acids, contain components called docosahexaenoic acid (DHA) and eicosapentaenoic acid (EPA). These acids are naturally found in the retina of the eye and are vital nutrients that maintain healthy function of the retina. As we get older, our bodies may produce less DHA & EPA and the only the way the body can take in these vital essential fatty acids is through proper nutrition and supplementation. Omega-6 fatty acids which causes inflammation, blood clotting, and cell proliferation are abundant in modern diets. They are found in seeds and nuts, and the oils extracted from them. Refined vegetable oils, such as soy oil, are used in most of the snack foods, cookies, crackers, and sweets in the American diet as well as in fast food. Soybean oil alone is now so ubiquitous in fast foods and processed foods that an astounding 20 percent of the calories in the American diet are estimated to come from this single source. The dietary imbalance may explain the rise of such diseases as asthma, coronary heart disease, many forms of cancer, autoimmunity and neurodegenerative diseases, all of which are believed to stem from inflammation in the body. The imbalance between omega-3 and omega-6 fatty acids may also contribute to obesity, depression, dyslexia, hyperactivity and even a tendency toward violence. Does TheraLife® Dry Eye Enhanced work without Omega-3 Fish Oils? Yes. Most of our customers have successfully treated their dry eye conditions solely using TheraLife® Dry Eye Enhanced. TheraLife® recommends the use of fish oils as a tear “thickening” agent to help prevent excessive tear evaporation while TheraLife® Dry Eye Enhanced is working to restore your body’s own ability to produce naturally healthy tears. You can also obtain omega-3 oils by eating fish and other foods that naturally contain it.